Sneem is a village in Co. Kerry, South West Ireland. Long associated with a remote and relaxed way of living. It is situated in the famous "Ring of Kerry" a route that encapsulates some of the best nature has to offer. Nestled between mountains and wild and rugged coast it offers some of the best views in the country, to be experienced either from the car, on foot or on a cycle as the weather dictates! 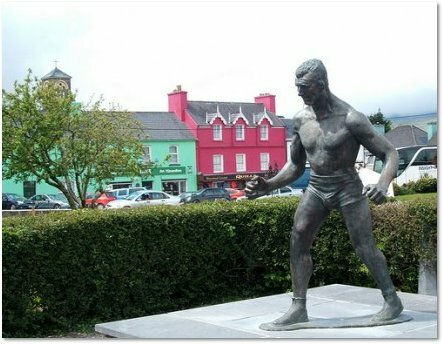 The village is split in two by the Sneem River, with the respective sides being known as North Square and South Square. Each part of the village has its own feeling and special beauty, there is really no better way than to spend a day exploring. If you are yet to visit Sneem why not have a look at my attempt at a "Virtual Sneem" which should give you a better understanding of the layout of the village. Although this web site is mainly intended to be about our house and the nature around it I feel I have to share the news that there is no where nicer to visit than Sneem. Note I am in no way connected to any of the businesses mentioned on this site.